Vibrant Happy Women | Listen Free on Castbox. How to Subscribe to Vibrant Happy Women: Apple Podcasts · Android · Overcast · Castbox · Radio Public About this Happy Bit: What do you want in life? Without commitment, it's nearly impossible to get there. But when you set an intention to SHOW UP and do the WORK of growing and transforming your life, miracles really do happen. Learn more about the art of commitment in this Happy Bit. Guess what? You can now join the Vibrant Happy Women Club! Join at vibranthappywomenclub.com Subscribe to the Vibrant Happy Women Podcast: Apple Podcasts · Android · Overcast · Castbox · Radio Public How to Leave a Review: Give us a Rating & Review · How to Leave a Review · Ask Jen a Question: Have a comment or question for me? Email me at support@jenriday.com. I'd love to hear from you! How to Subscribe to Vibrant Happy Women: Apple Podcasts · Android · Overcast · Castbox · Radio Public About this Episode: Do you ever wonder how successful people get to where they are? What’s their secret? Ann Marie Sabath divulges some simple, straightforward success secrets that have been the the key to many self-made millionaires’ accomplishments. The best part is, these secrets are skills that you can start using right now to bring more success, fulfillment and satisfaction into your life. What You'll Learn: How you can turn any failure into something positive Why being 10 minutes early improves your success What brain benefit comes from clearing clutter Why it’s a good idea to pre-plan purchases Why “walking the talk” is the secret to living the life you want And many more tips for success! Links From This Episode: Vibrant Happy Women Club www.annmariesabath.com The Fringe Benefits of Failure and the Importance of Imagination by J.K. Rowling What Self-Made Millionaires Do That Most People Don’t by Ann Marie Sabath Follow Ann Marie on Twitter Follow Ann Marie on Facebook Follow Ann Marie on Instagram Jen on Instagram Jen on Facebook Join the Vibrant Happy Women Club: Learn more at vibranthappywomenclub.com Subscribe to the Vibrant Happy Women Podcast: Apple Podcasts · Android · Overcast · Castbox · Radio Public How to Leave a Review: Give us a Rating & Review · How to Leave a Review Ask Jen a Question: Have a comment or question for me? Email me at support@jenriday.com. I'd love to hear from you! How to Subscribe to Vibrant Happy Women: Apple Podcasts · Android · Overcast · Castbox · Radio Public About this Happy Bit: Want to make a change that actually STICKS? Rather than relying on will power, there is a better way, and I'll tell you the trick in this Happy bit. Guess what? You can now join the Vibrant Happy Women Club! Join at vibranthappywomenclub.com Subscribe to the Vibrant Happy Women Podcast: Apple Podcasts · Android · Overcast · Castbox · Radio Public How to Leave a Review: Give us a Rating & Review · How to Leave a Review · Ask Jen a Question: Have a comment or question for me? Email me at support@jenriday.com. I'd love to hear from you! How to Subscribe to Vibrant Happy Women: Apple Podcasts · Android · Overcast · Castbox · Radio Public About this Episode: Bravery is defined as having courageous behavior...and being a mother undoubtedly requires heaps of bravery! In this episode with Rachel Martin, find out how to be a brave mother when life throws you curveballs, when you feel constantly bombarded by comparisons swirling on social media, and how you can find ways to joyfully embrace your days before they pass you by. What You'll Learn: How motherhood is like a beautiful, but unique, painting The secret of how to let go of “mom guilt” Several strategies on how to be a brave mom Why “93 is a good as 100” How to stop making excuses and “grab the days” And much more Links From This Episode: Vibrant Happy Women Club www.findingjoy.net The Brave Art of Motherhood Adele Skyfall One Year Off by David Cohen Brendon Burchard Flylady Jen on Instagram Jen on Facebook Follow Rachel on Twitter Follow Rachel on Facebook Follow Rachel on Instagram Get 20% off your Miracle Suit when you go to miraclesuit.com/happywomen and enter promo code HAPPYWOMEN at checkout! Visit plantoeat.com/happywomen and you can start a free 60-day trial! 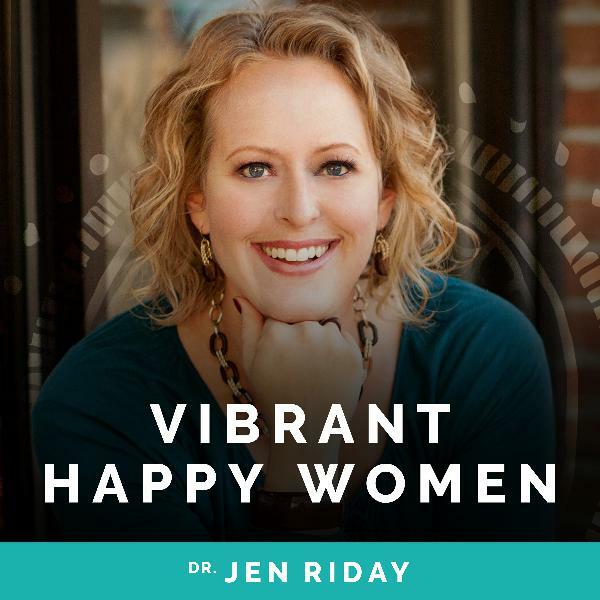 Join the Vibrant Happy Women Club: Learn more at vibranthappywomenclub.com Subscribe to the Vibrant Happy Women Podcast: Apple Podcasts · Android · Overcast · Castbox · Radio Public How to Leave a Review: Give us a Rating & Review · How to Leave a Review Ask Jen a Question: Have a comment or question for me? Email me at support@jenriday.com. I'd love to hear from you! How to Subscribe to Vibrant Happy Women: Apple Podcasts · Android · Overcast · Castbox · Radio Public About this Happy Bit: Do you believe in the persona of "good mom" presented from society, friends, and family? In this Happy Bit we'll say HECK NO to the "good mom" stereotype and instead find our own core version of excellent motherhood and womanhood. Click here to learn more about the Vibrant Happy Women Retreat: Subscribe to the Vibrant Happy Women Podcast: Apple Podcasts · Android · Overcast · Castbox · Radio Public How to Leave a Review: Give us a Rating & Review · How to Leave a Review · Ask Jen a Question: Have a comment or question for me? Email me at support@jenriday.com. I'd love to hear from you! How to Subscribe to Vibrant Happy Women: Apple Podcasts · Android · Overcast · Castbox · Radio Public About this Episode: Do you ever feel like there’s more to life than what you are currently experiencing? That there are passions and talents inside you that are begging to be discovered? I talk with Jill Stanton all about how to zero in on what sparks you, enlivens you, and brings you fulfillment -- AND how to be courageous enough to get it. What You'll Learn: Why it’s important to “go to bat” for your life The secret to figuring out what gives you a spark 6 questions to ask yourself when seeking clarity about your life goals How using the mantra “I’m the type of chick who gets everything she wants” can help you daily! And much more! Links From This Episode: Vibrant Happy Women Club screwtheninetofive.com Daniel Laporte Audio books: Secret of the Millionaire Mind Breaking the Habit of Being Yourself by Joe Dispenza Jen on Instagram Jen on Facebook Follow Jill on Facebook Follow Jill on Instagram Join the Vibrant Happy Women Club: Learn more at vibranthappywomenclub.com Subscribe to the Vibrant Happy Women Podcast: Apple Podcasts · Android · Overcast · Castbox · Radio Public How to Leave a Review: Give us a Rating & Review · How to Leave a Review Ask Jen a Question: Have a comment or question for me? Email me at support@jenriday.com. I'd love to hear from you! How to Subscribe to Vibrant Happy Women: Apple Podcasts · Android · Overcast · Castbox · Radio Public About this Happy Bit: If someone asked you what you want to DO, you'd probably have an answer, like take a nap, go to the spa, take a vacation. But would you know the answer if someone asked you who you want to BE? Click here to learn more about the Vibrant Happy Women Retreat: Subscribe to the Vibrant Happy Women Podcast: Apple Podcasts · Android · Overcast · Castbox · Radio Public How to Leave a Review: Give us a Rating & Review · How to Leave a Review · Ask Jen a Question: Have a comment or question for me? Email me at support@jenriday.com. I'd love to hear from you! How to Subscribe to Vibrant Happy Women: Apple Podcasts · Android · Overcast · Castbox · Radio Public About this Episode: Does the energy in your home make you happy? Or are you experiencing more conflict and negativity than you’d prefer? In this episode guest Patricia Lohan shares how the principles of Feng Shui can help our homes feel more harmonious. What You'll Learn: How Feng Shui is like acupuncture for your home What the 5 elements of energy are and how they can bring balance into your home That you can create an environment in your home for what it is that you want to create in your life How to create spaces in your home for the different aspects of your life How doing something as simple as cleaning your front door can welcome new, positive energy into your home And much more! Links From This Episode: Vibrant Happy Women Club www.PatriciaLohan.com The Happy Home: Your Guide to Creating a Happy, Healthy, Wealthy Life by Patricia Lohan How to Fung Shui your office for success The Seven Spiritual Laws of Success by Deepak Chopra Open: An Autobiography by Andre Agassi Jen on Instagram Jen on Facebook Follow Patricia on Instagram Follow Patricia on Facebook Follow Patricia on Twitter Miracle Suit Plan to Eat Join the Vibrant Happy Women Club: Learn more at vibranthappywomenclub.com Subscribe to the Vibrant Happy Women Podcast: Apple Podcasts · Android · Overcast · Castbox · Radio Public How to Leave a Review: Give us a Rating & Review · How to Leave a Review Ask Jen a Question: Have a comment or question for me? Email me at support@jenriday.com. I'd love to hear from you! How to Subscribe to Vibrant Happy Women: Apple Podcasts · Android · Overcast · Castbox · Radio Public About this Happy Bit: What legacy did your parents and grandparents leave for you in terms of behaviors, patterns, emotions, skills? And what legacy are you leaving for your kids, spouse, friends and loved ones? In this Happy Bit I talk about my grandmothers and the legacy they each left for me. Click here to learn more about the Vibrant Happy Women Retreat: Subscribe to the Vibrant Happy Women Podcast: Apple Podcasts · Android · Overcast · Castbox · Radio Public How to Leave a Review: Give us a Rating & Review · How to Leave a Review · Ask Jen a Question: Have a comment or question for me? Email me at support@jenriday.com. I'd love to hear from you! How to Subscribe to Vibrant Happy Women: Apple Podcasts · Android · Overcast · Castbox · Radio Public About this Episode: What happens when your world is turned upside down with the death of a loved one? How do you cope? How is it possible to see anything good in the heaviness of it all? My inspiring guest, Stacy Nehring, shares how she is doing just this in the face of a devastating loss. What You'll Learn: Why having gratitude can help you see the good even during your darkest times How you can support a friend that’s going through a difficult time Why it’s essential to have a support system What good things the "Live Like Lilli" foundation is doing for the community And much more Links From This Episode: Vibrant Happy Women Club GirlsInc iGen Book - Why Today's Super-Connected Kids Are Growing Up Less Rebellious, More Tolerant, Less Happy--and Completely Unprepared for Adulthood--and What That Means for the Rest of Us Bosch Mixer Cake by Courtney Glow Kids Jen on Instagram Jen on Facebook Like Stacy's Facebook Page Follow Stacy on Facebook Perfect Keto Join the Vibrant Happy Women Club: Learn more at vibranthappywomenclub.com Subscribe to the Vibrant Happy Women Podcast: Apple Podcasts · Android · Overcast · Castbox · Radio Public How to Leave a Review: Give us a Rating & Review · How to Leave a Review Ask Jen a Question: Have a comment or question for me? Email me at support@jenriday.com. I'd love to hear from you! this was a great episode. It fit in well with my thoughts today. thank you!! !